Try the Comforel ® FreshFX ® pillows as Featured in Many Best Western ® Hotels! Supportive comfort seems like a difficult term when creating pillows, but the Pillow Factory ® did just that when they created the Comforel ® FreshFX ® pillow. 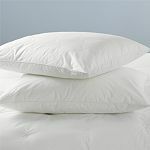 The polyester fibers in these pillows have been treated with FreshFX ® antimicrobial that will ensure that your pillow is free of odor causing mold, bacteria, and fungus. These pillows are also wrapped in a luxuriously, super-soft 100% cotton covering. Treat yourself to this divine pillow, and get the best nights rest that you have ever had!